Battered by hurricanes, political strife and trade bans, the island nation of Cuba survives thanks to a resilient people. Despite poverty conditions and an aging infrastructure, there are those who thrive. Many make a living from the tourist industry. Cuba is mostly an unspoiled natural paradise and well-worth seeing. Good travel deals can be found in Winter and I purchased an all-inclusive package for an unbelievably economical (low) price! I was curious about the “underwater city” and December was the perfect time to investigate. Temperatures were dropping and work was getting insane with stressful situations recurring on a daily basis. Much can be said for escaping Winter! As you step off the plane, the tropical heat immediately warms with therapeutic effect. At customs, young people in military uniform greet you. The first time I saw the kids with guns, I thought of the movie “Logan’s Run” but with each visit, Cuba seemed more and more welcoming. With their fishnet stockings and short skirts, the young women look more Marxist Chic than revolutionary soldier. You can relax and take it easy on the resort but it is worthwhile to sign-up for excursion tours. There is plenty to see as the country is over 42,000 square miles! 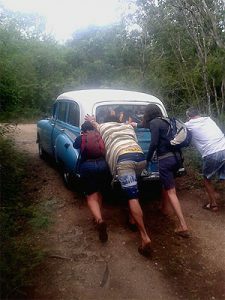 Some tours are offered in vintage cars and while it is cool to sit in a 1956 or 57 vehicle, you might just end up pushing it up the road with the other tourists, hoping it will start again (see photo at top – more on that later!). Much of Cuba is covered with green space. On the highways and byways, you might see an oil refinery or a farm here or there but you will rarely see the commercial billboards and Mordor-like ugliness of the “developed” nations. The first excursion took me past breath-taking valleys and over high bridges to Havana. For the price, the “Havana Colonial Tour” is a solid introduction to the maze of streets and squares. Multiple eras of architecture are still standing in this famous port and the craftsmanship is truly amazing. There are safety hazards (broken sidewalks) everywhere, so be careful, but looking around one immediatley feels the compulsion to return! The cobblestoned colonial area looks like the olden cities of Spain or Italy and I could picture myself spending some time, relaxing in a cafe here, maybe sampling a fine Cuban cigar or drinking excellent coffee. 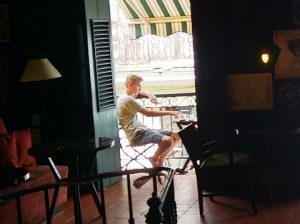 Cafe O’Rielly in Havana is a good place to rest weary feet. Unfortunately, no one I spoke to on these initial excursions had any idea about the underwater city (see part 1 of this series). Maybe my horrible Spanish was to blame but even with the help of an interpreter, such questions were met with blank stares. I decided to attempt to talk with a scientist on my next visit. A little over a month later, I was back in Havana visiting the museums. From the bachside hotels outside of the city, a bus gets you to downtown Havana within an half-hour. You can grab a cab from there to the University where on the second floor of a u-shaped building they have the Museo Antropológico Montané (The Montaine Museum of Anthropology) or you can just linger downtown. On one occasion, I walked to the Plaza de Armas where they have the Cuban National Natural History Museum. Unfortunately, the geologist Manuel Iturralde-Vinent who investigated the underwater city (mentioned in Part One) wasn’t there. Google now says he was “the former deputy director of the Cuban National Natural History Museum” when you search his name. A little past the plaza, I found an archaeological museum. Like the University museum, this place had artifacts from the ancient American world. Looking at the carved and crafted paraphernalia, small statues of Shamans and serpent motifs, I considered the importance of hallucinogens to the pre-Columbian islanders. These were a vision-seeking people who lived in a shamanic culture. For whatever reason, I got the feeling that hallucinogens and changes in consciousness are somehow involved in the underwater civilization mystery. On the way out, I was introduced to an English-speaking gentleman and I asked about the ancient Maya and Cuba. He knew of no stone ruins or ancient Mayan settlements in Cuba but directed me to the “Instituto Cubano de Antropología” in Havana. After a light lunch at the Cafe O’Rielly, I followed the narrow streets to the Institute tucked away in a colonial-era building. An elderly gentleman sat behind the desk but could not speak English. He motioned to sit and wait. With his long dark hair and commanding presence, the man who appeared made me think of the young Che Guevara! For the purposes of this essay, I will refer to him as “X”. It seems the institute doesn’t receive many visitors and I was soon surrounded by anthropologists and scientists all curious about the unexpected patron. They were good guys – smiling and sincere – and must have thought I was an academic. I was embarrassed by all the attention. “X” the anthropologist told me there were some “fringe theories” about the first Cubans but underlined these ideas must be treated with skepticism. There were theories the original Cubans had arrived from South America or Florida but he was very doubtful that the ancient Maya settled or built stone buildings on the island. There might only be a small channel between the Mexican Yucatan and the Cuban mainland but a powerful current interferes with direct travel and could push a small craft off course, possibly out to the Florida keys. Although the Maya used large canoes for trade, most academics believe they practically hugged the coast, never leaving the sight of land. Later on, I found a paper that cautiously discusses evidence for “sporadic”, “infrequent” and “indirect” trade between Mayans and peoples of the Caribbean as far away as Antigua (see http://research.famsi.org/aztlan/uploads/papers/Canter-Yucatan-Channel-and-Trade.pdf). I soon realized the Cuban Underwater City topic would be a no-go; underwater ruins, UFOs and hidden civilizations would be a conversational non-starter with these sober and careful men. “X” asked me if I was an archaeologist(?). “No, my degree was in psychology”, I answered. I am not exactly sure what “X” said next to his co-workers but they were soon beside themselves with laughter! I appreciated their sense of humor and thanked them for their time. Throughout the world, academics must protect their reputation. If I were to discuss “fringe” topics with such highly qualified academics, I would have to learn the language of archaeology (fluent Spanish would also be helpful!). Not long after the meeting, I attended an archaeology class near my home. Reviewing the controversial history of the discipline, you can see why the caution exists; there were many blind alleys! Yet I also believe academic freedom is necessary and aids progress in each discipline. I don’t blame the Cuban scientists for being “healthy skeptics” but wonder if modern academics are just a little too careful. The overtly materialist and detached perspective reigns supreme. Just mentioning the word “magic” is enough to make some flinch! It occured to me that the Cuban geologist Manuel Iturralde-Vinent was one of those careful scientists who must have been intrigued by the strange patterns found by Zalitzki and Weinzweig. The “grey plate” in the middle of the city-like features seemed truly bizarre to the scientist because it did not belong in the accepted narrative and paradigm. Iturralde-Vinent’s involvement only deepens the mystery; the last thing we hear is that the site needs further investigation and the cost is considerable.